Looking back over the television of my youth, there were many, many high-lights, from Knight Rider and Street Hawk to Eerie Indiana and Rent-a-ghost. However one television delight that nearly all my friends and contemporise seem to have forgotten about is Tales of the Gold Monkey. 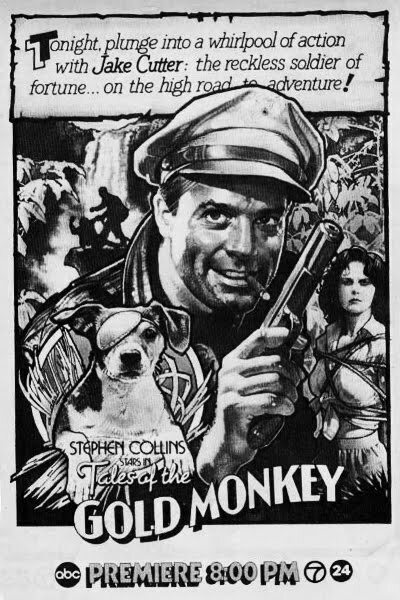 Inspired by the 1930’s adventure serials that would be shown before the main feature, with rugged heroes, feisty females in distress and shadowy bad guys, Tales of the Gold Monkey had it all. I remember sitting down on Monday evening, watching Jake fly about the South Pacific in his sea-plane, the Cutter’s Goose, with his trusty Jack Russell in toe, try to outwit whoever was on his case that week. Set in the South Pacific in the late 1930’s, giving the feel of a cross between Casablanca and Hawaii 5-0 with shady Nazi spies and colourful locals are trying to cause trouble in one way or another. The series was about an ex-fighter pilot named Jake Cutter (Stephen Collins). Who was the operator of an air cargo service based on the fictional South Seas island Bora Gora, flying his red and white Grumman Goose see-plane called Cutter’s Goose. Jake is surround by a number of colourful characters, his best friend and mechanic Corky (Jeff MacKay), a good-hearted alcoholic whose memory is hazy as a result of the booze he consumes. He also has a one-eyed Jack Russell terrier named Jack, who barks once for “no” and twice for “yes”. Jake’s love interest and U.S. Government spy contact is Sarah Stickney White (Caitlin O’Heaney). She sings in the Monkey Bar as a cover for her espionage activities. Then there was the Reverend Willie Tenboom (John Calvin), a phony man of the cloth who likes to “bless” the female natives in private “prayer”, is in actuality a Nazi spy named Willy, with interests in both sides. Then over seeing all these goings on is “Bon Chance” Louie as the owner of the Monkey Bar and the French magistrate for Bora Gora. The show had a the feel of slimmed down version of Raiders of the Lost Ark, with treasure hunting, Nazi bad guys and tropical settings, along with family friendly evening television themes. Created by Donald P. Bellisario, the show had links to many of his other shows, such as Magnum, P.I. and Quantum Leap with similar characters being used within the different show. Created during the time of such shows a Dallas and other should-pad powered offerings, Tales of the Gold Monkey was something very new and different to viewers at the time; giving the viewer some true escapism, away from the money grabbing times. Where all you had, was your trusty friend by your said and you were always ready for a bar fight at the drop of a hat. With so so 80’s special effect but with great pulpy storylines, you could help but be swept up the adventures of Jake Cutter and his Goose. With plenty of action; one episode I can remember is that of a goldmine about to blow up with Jake inside only to escape on a motorbike just as it exploded; and good humour it was always fun to watch. It was such a shame that only one season was ever made of the show. Though it did give us 21 top episodes and the idea for another kid’s favourite back in the day “Talespin” for Disney. So for those of you out there that still remember this great little show I salute you, for those that don’t, track it down and enjoy a lost gem.